Real war is nothing like what ordinary people think it is. Movies and televisions shape their perceptions. To complicate matters, modern technology is changing the face of warfare. Nowhere was this more evident than in the Gulf War. Precision bombing and other modern marvels lessened the importance of human soldiers on the ground. After all, why endanger soldiers when it is easier and potentially safer to bomb targets from the air? At one point in Jarhead, Allen Troy (Peter Sarsgaard, The Dying Gaul, Flightplan), vents his frustration. Troy is a marine sniper, and the time gets in position (if ever), the war would move on, rendering him obsolete. Jarhead, based on a memoir by Gulf War Vet Anthony Swofford, is about an ordinary soldier's experiences in War, and how it is unlike anything he/she ever expected. It is a jumble of conflicting emotions and moods - camaraderie and alienation, utter boredom and excitement, mischief and strict devotion. Jarhead the film does a decent job of portraying these various moods, but by doing so gets lost in the muddle and forgets to be a film about something. Director Sam Mendes (Road to Perdition, American Beauty) could have made a darkly comic look at military life, or a rah rah movie extolling the value of patriotism. He does both at times, but mostly lands in the middle, echoing the varying thoughts of the narrator, Anthony Swafford (Jake Gyllenhaal, Proof, The Day After Tomorrow). Mendes and adapter William Broyles Jr.'s (The Polar Express, Unfaithful) problem is that the tedium that Swafford is feeling translates over to the audience. Somehow, they needed to make the tedium compelling (as paradoxical as that sounds), and they did not. 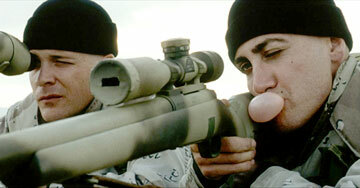 Swafford goes from screw-up to marine sniper in Camp Pendleton. Staff Sgt. Sykes (Jamie Foxx, Stealth, Ray) thinks that he has something that he can mold into one of the most prestigious roles in the military. Swafford, partnered with Troy, make the cut and are prepared to go to Iraq to do their duty. And they wait. And nothing happens. When they finally go to Iraq, they wait some more. From Swafford's perspective, it is extremely frustrating. He has the training to kill, yet all he does is practice. To pass time, the soldiers bond, practice more, play football, and get into trouble. Jarhead picks up once the soldiers see some combat. Here, they patrol completely in the dark, figuratively and literally. They have no idea what is going on around them or on a macro level. 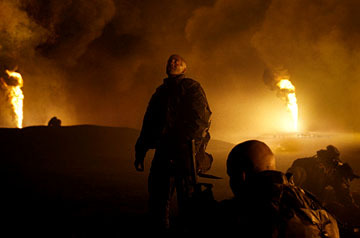 Mendes shoots some beautifully horrific imagery, and Marines look into the horizon at lit oil wells. Fire shoots up into the skies and the oil in the atmosphere makes everything dark. Swafford hates it. Yet he loves being a Marine. Mendes does not explore this dichotomy enough. He puts forth the ideas on screen, then doesn't go anywhere with them, turning the film into a very superficial affair. 2 hours, 3 minutes, Rated R for pervasive language, some violent images, and strong sexual content.